Well, it’s official – money won’t buy you happiness. But it might buy you stress. Recently at LinkedIn Learning, we released a course from Heidi Hanna, the executive director of the American Stress Institute, on dealing with workplace stress. But we wanted to see how big the problem was. 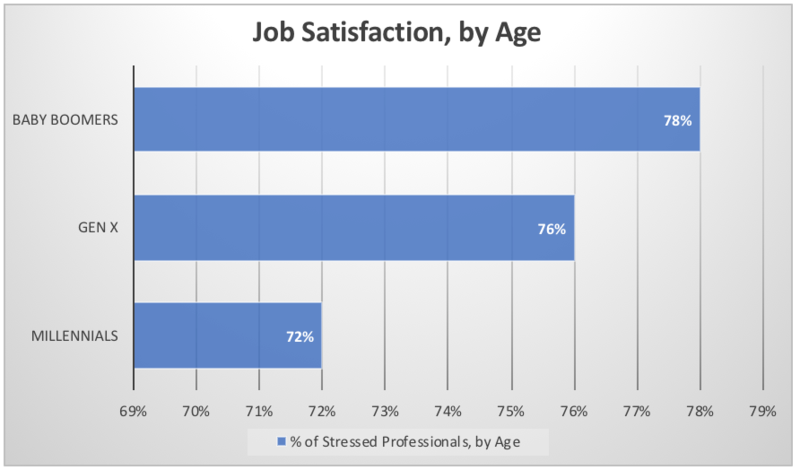 So, we surveyed professionals in the U.S. and asked them how stressed they were in their job, how satisfied they were with their job and their income, among other questions. A big finding – the more money people make, the more stress they tend to feel at work. And yet their job satisfaction doesn’t improve. 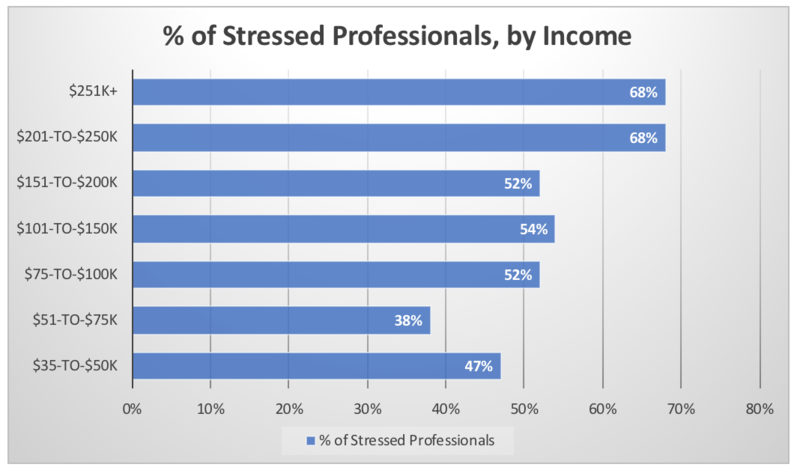 First, we took a look at stress at work, as it relates to income. What we found is that as people’s income increased, so generally did their stress level. For example, 47 percent of people making $35,000-to-$50,000 a year said they were stressed at work. Conversely, 68 percent of people making more than $200,000+ annually said they were stressed at work. Sure, high-paying jobs might be stressful. But they are the most satisfying jobs too, right? Well, not according to the data. What we found is that people making $50,000-to-$75,000 a year were the most satisfied with their jobs, with 81 percent saying so. After that, job satisfaction drops slightly and then mostly plateaus, with just 74 percent of people making more than $250,000 a year saying they were satisfied with their jobs. 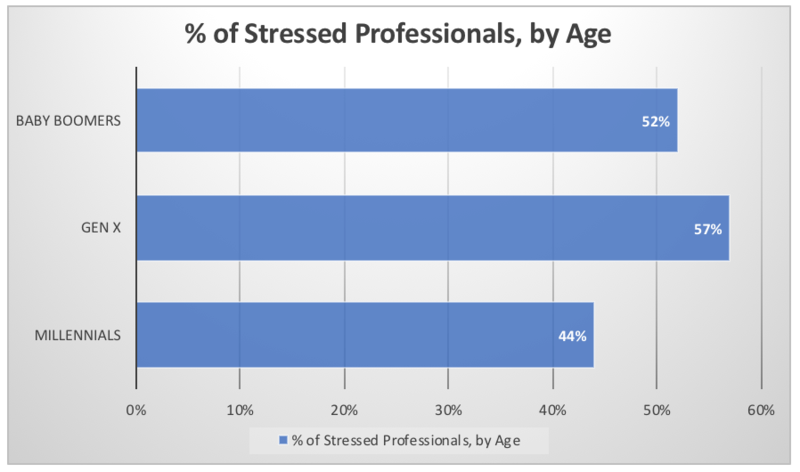 What age bracket is the most stressed at work: millennials, Gen X-ers or baby boomers? Gen X-ers, as 57 percent of people 37-52 said they were stressed in their jobs. Conversely, only 44 percent of millennials said they were stressed at work. And yet, there appears to be no correlation with satisfaction. Despite feeling the least amount of stress, millennials are also the least satisfied with their jobs. Baby boomers are the most, with 78 percent of people 53-and-older saying they were satisfied with their job. 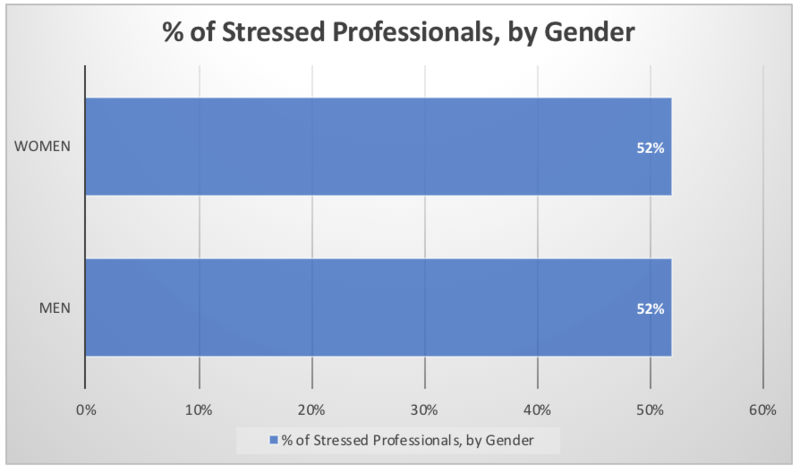 Who is more stressed at work – men or women? Here’s the big question. Who feels more stress at work, men or women? The answer: they feel the exact same. Both 52 percent of men and of women said they were stressed in their role. How about satisfaction? Who is more satisfied in their role, men or women? Again, no meaningful difference, as 76 percent of men and 75 percent of women said they were satisfied with their job. Let's say you are in the 52 percent and feel stressed in your job. 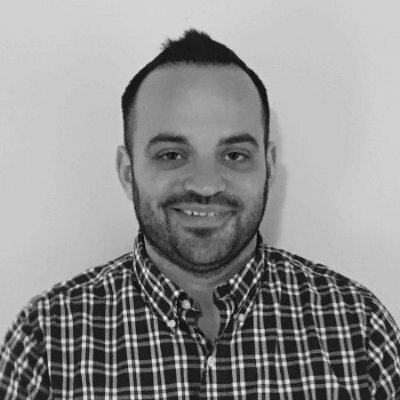 How should you address it? Well, in her course Hanna emphasized that you can’t solve chronic stress with a one-time event. Instead, she recommends doing an exercise called the BFF method (which stands for breathe, feel and focus) several times throughout your day. Watch Heidi Hanna, the executive director of the American Institute of Stress, describe the BFF method. The first step of the BFF method is to calm your mind by focusing on your breath. To do this, find a quiet place (your office, a break room, whatever) and close your eyes. Then, put all your attention on your breath, counting to five as you inhale and then counting to five as you exhale. Do this three or four times. If it’s difficult for you at first, don’t worry – it’ll get easier and easier with practice. Almost immediately after doing this, you’ll feel calmer and more centered. Stress occurs when you buildup negative, stress-causing thoughts in your mind. Examples include: I’m never going to have enough time to do that report, I’m not qualified to do that presentation, I’ll never get out of this rut. You can change the chemistry of your body by thinking positive thoughts, instead of wallowing in those negative ones. And that’ll dissipate your stress. To do this, after you are done focusing on your breath, think of what you are most grateful for in this world – your family, your job, your friends, the weather that day, whatever. After you calm yourself with some breathing and feel those grateful thoughts, it’s time to move to the final stage: focus. Here, focus on how you want to show up in the upcoming moment. For example, say you are about to go to a meeting. In this stage, focus on exactly how you want to show up in that meeting – perhaps confident, informed and open. Same goes for coming home from work. Stress is clearly an issue in today's workplace. And not addressing causes unproductivity, turnover and even medical issues. Hence, to be a more effective employee, you need to have a strategy for dealing with stress. And there's no better place to look for strategies than Hanna and her course, a PHD who has spent her career researching how to fix this exact problem. Results are based on a survey of nearly 1,000 LinkedIn members in the United States who indicated they are currently employed. Want to learn more? Watch Hanna’s full course, Managing Stress for Positive Change.